This cheesecake has a light almost soufflé-like texture. The fresh blueberry compote is spooned over each slice before serving. It's a real late summer treat. Crust - Position a rack in the center of the oven and preheat the oven to 350 degrees F. Lightly grease the bottom and sides of a 9" springform pan. In a medium bowl, combine the graham cracker crumbs, sugar and melted butter. Pat the mixture into the bottom of the prepared pan. Bake the crust for 8 minutes or until lightly browned. Set the pan on a wire rack to cool completely. Reduce oven temperature to 325 degrees F.
Filling - In the bowl of an electric mixer, using the paddle attachment, beat the cream cheese at medium-low speed until creamy, about 2 minutes. Gradually add 1 cup of the sugar and beat until blended. Add the egg yolks one at a time, mixing well after each addition and scraping down the sides of the bowl as necessary. Add the lemon zest, lemon juice, and vanilla extract and mix until blended. Add the sour cream and mix until combined, scraping down the sides of the bowl as needed. In a clean mixer bowl, using the whisk attachment, beat the egg whites at medium speed until they begin to turn opaque. Very gradually add the remaining 1/3 cup sugar, then increase the speed to high and beat until softs peaks form. Using a rubber spatula, gently fold one-third of the whites into the cream cheese mixture. Fold in the remaining whites in two more additions. Scrape the batter into the cooled crust and smooth the top into an even layer. Cut a 18-inch square of heavy duty aluminum foil and wrap the foil around the outside of the pan. Place the pan in a roasting pan or large baking pan. Pour enough hot water into the roasting pan to come up the sides 1 inch. Bake the cheesecake in the water bath for 50 t0 5 minutes, until just set. Turn the oven off and prop the door open. Leave the cake in the oven for 1 hour to set completely. Remove the cake from the water bath and set it on a wire rack to cool completely. Refrigerate the cheesecake at least 6 hours before serving. Blueberry Compote - In a small saucepan, combine 1 cup of blueberries with the sugar. Cook over medium-low heat, stirring frequently, until the berries pop and release their juices, about 7 minutes. Strain the mixture through a fine-mesh sieve into a bowl, pressing down on the berries to release as much liquid as possible. Discard the berries in the sieve and let the blueberry juice cool. Stir in the remaining 2 cups of berries and the lemon juice into the juices. To serve, remove the sides of the pan, slice the cake with a think-bladed sharp knife, wiping the knife clean between each cut. 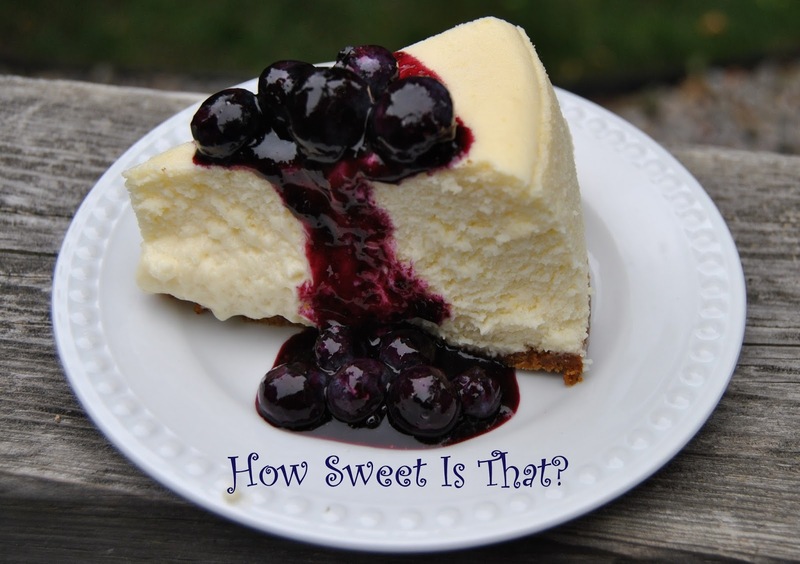 Serve each slice topped with a generous amount of blueberry compote. Store in the refrigerator, loosely covered, for up to 2 days. Makes one 9-inch cake, serves 10 to 12.